First a note on the term. In predictive dialing the dialer tries to look ahead and predict when one of your agents is likely to be free, and dials ahead of the fact to reduce agent waiting time. It bases its prediction on the average length of conversation and the average time taken to connect a new call. Since these two measures are based on averages, it works better for larger teams and often fails to keep idle time low for small ( to 5 agents) and medium (5 - 40) teams unless tweaked. This post explains some of the tweaks provided by Vicidial. Vicidial uses the term adaptive instead of predictive. This is because Vicidial adapts the number of calls per agent (pacing ratio) based on the 2 averages described above. Go to detailed view of campaigns and scroll down to the first green section. Under Dial Method it gives you 3 adaptive options, of which choose adapt_tapered for the time being. Below this Vicidial provides many options to tweak the performance of the predictive formula to reduce agent wait time. The foremost of these is "Available only tally". When set to "y" means base predictive calculations only on idle agents. For example, if all agents are on calls, stop dialing completely. After an agent becomes free, then begin dialing the next set of numbers for him/her. This automatically causes idle time, since the dialing process begins after an agent becomes free. Available only tally = n means keep dialing based on the number of agents in the entire team (logged in but not paused), in the expectation that soon an agent will become free. The predictive principle is based on the average conversation time of the entire team, hence in most circumstances we recommend keeping this at "n"
You may be thinking that to allow the dialer to continue dialing even if there are no free agents should increase drop rate. Counter-intuitively, the opposite is true. Setting Available only tally = y actually increases drop rate. The reason for this is that in its attempt to get a call to the idle agent, the dialer typically over dials and ends up with more than one connection for the idle agent. However, for very small teams, the dialer's predictions will be poor, hence in Vicidial 2.4, we have a new related option "Available only tally threshold" which is normally disabled. 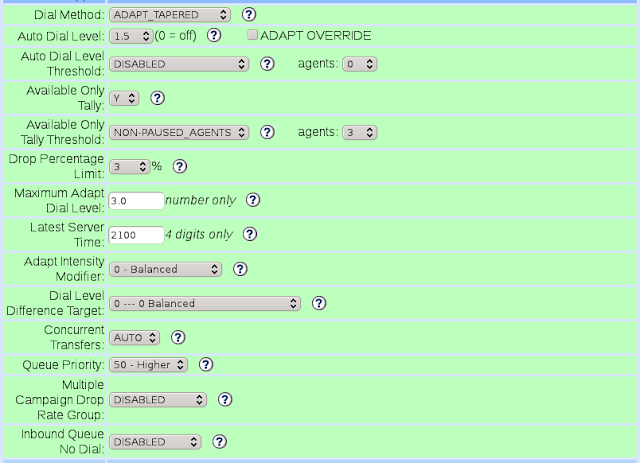 Select "Non-Paused Agents" in the drop down and set the agents to 3. This will make "Available only tally" = y below the threshold, assuming you have set it to n in the first place. The adaptive nature of vicidial's algorithm looks at the drop rate you are comfortable with (specified by law in some countries) and reduces the pacing ratio if the current drop percentage is more than set. 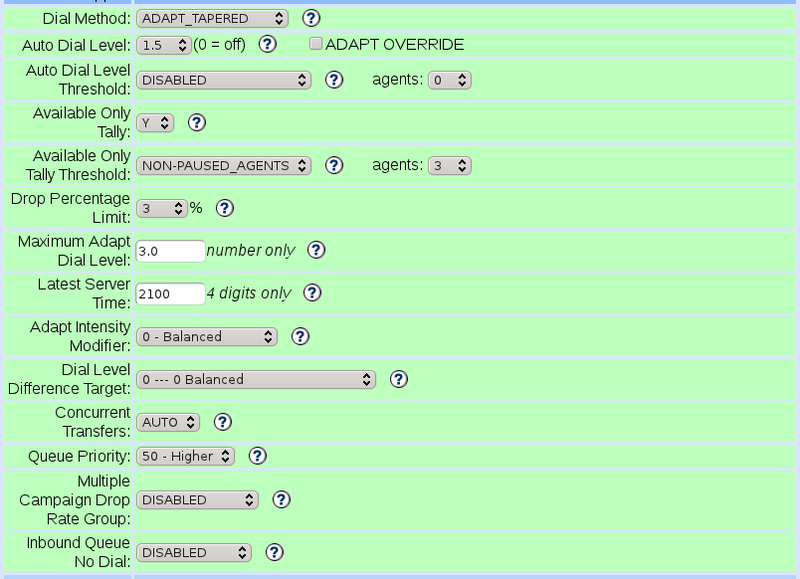 This gives rise to the three types of adaptive dialing methods provided by Vicidial. From Vicidial's help menu: "ADAPT_HARD_LIMIT will dial predictively up to the dropped percentage and then not allow aggressive dialing once the drop limit is reached until the percentage goes down again. ADAPT_TAPERED allows for running over the dropped percentage in the first half of the shift -as defined by call_time selected for campaign- and gets more strict as the shift goes on. ADAPT_AVERAGE tries to maintain an average or the dropped percentage not imposing hard limits as aggressively as the other two methods." This sets the maximum pacing ratio in adaptive dialing. Setting it too high for small teams may cause Vicidial to swing between dialing too much and dialing too little, simultaneously increasing drop percentage and idle time! Keep it at 3 in most cases. are best left untouched unless you know what you are doing. Scroll down to drop action and set it to in_group to send dropped calls to an ingroup. Let the ingroup play the safe harbor message but also allow the called person to stay on the line to speak to an agent. In this way an other wise dropped call will be retrieved. And a person that will wait to speak to an agent is likely a good prospect! Remember also to "allow inbound and blended", to select the ingroup you have chosen as the transfer group and to ask your agents to select the ingroup while logging in. Speak to our helpdesk if you would like help to set this up on your OwnPages dialer.